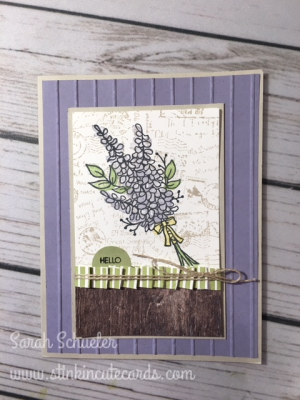 Here's another one of my favorites from our Stamp Camp back in Jan. We've again paired the Lots of Lavender with the Post Script. Now if you've missed the Winter Session of the Best Stamp Camp around, mark your calendar for Jun 23rd for the Summer Session. Tickets can be reserved here. Early Bird Registration runs thru May 23rd but reserve now so you don't forget! Make sure you like our Camp Facebook Page to get all the updates etc.